Dark Side Blades Ballistic Gold Dragon Assisted Opening Pocket Knife | BUDK.com - Knives & Swords At The Lowest Prices! 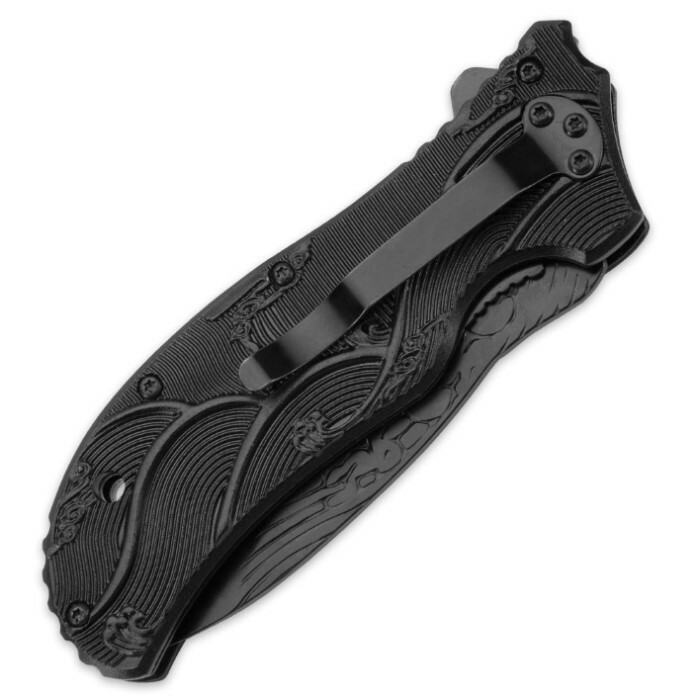 Dark Side Blades' Ballistic Dragon Pocket Knife is a echo of the great beast it depicts - graceful yet ferocious, beautiful yet bold. 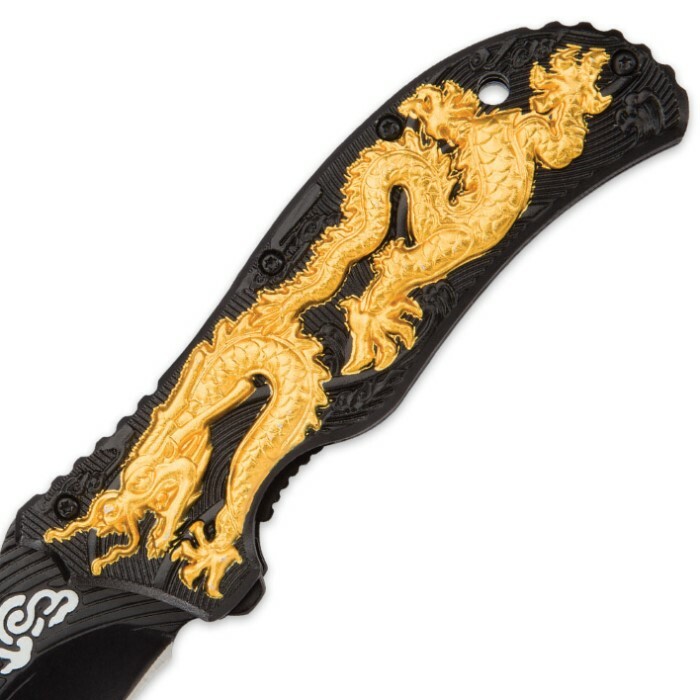 From the delicately grooved blade to the intricately carved gilded dragon handle, every inch of this stunning folder is exquisitely detailed and thoughtfully designed. The 3 1/2" stainless steel blade is finished in matte black, which provides the ideal backdrop for the distinctive white line art along the spine. The blade's reverse mirrors the unique illustration in finely etched outlines. Thanks to the incredible speed and fluidity of the exclusive "Ballistic" assisted opening mechanism, the blade is easily deployed with one hand in mere nanoseconds. An alluring melange of textures and light, the anodized aluminum handle is a veritable showpiece all on its own. A serpentine Asian-style dragon swirls lithely across the handle, unabashed in its golden splendor. Its unbridled radiance belies the subtlety beneath - namely, a delicately etched torrent of flowing lines, forming a traditional Asian wave pattern rendered in elegant three dimensional relief. Although perfect for display, the Ballistic Dragon knife also makes an excellent everyday carry, with its capable functionality, comfortable 4 3/4" closed length and built-in pocket clip. 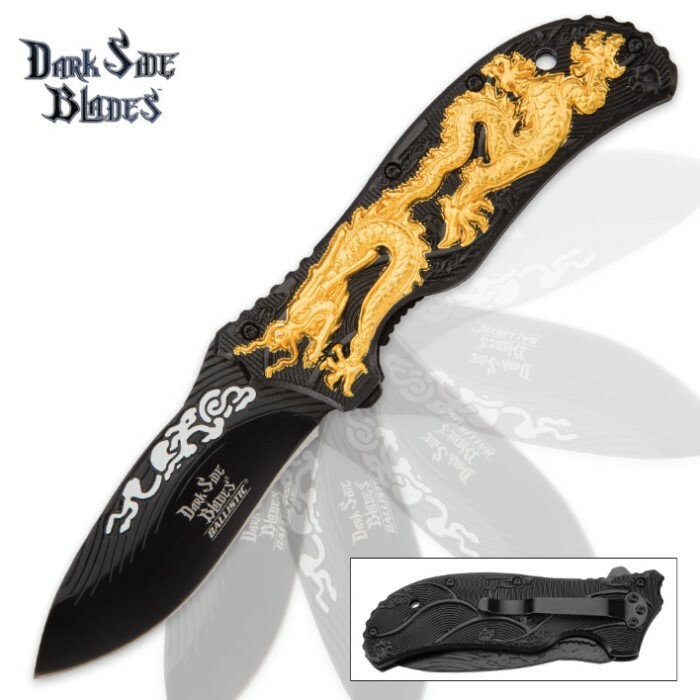 Regardless of how you use it, rest assured the Dark Side Blades Ballistic Dragon Assisted Opening Pocket Knife is in it for the long haul - the gilded dragon keeping watch, ever vigilant as the tides change.